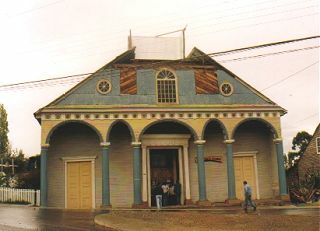 The Churches of Chiloé were placed on the list because of their unique form of wooden architecture and the mestizo culture they represent. The arrival of the Jesuits (1608) to this archipelago gave it its special mark. Groups of missionaries would travel around the islands, staying for a few days here and there. In each zone they would build chapels, looked after by laymen. 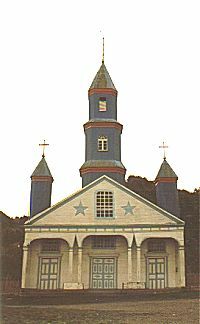 Currently, in Chiloé there are sixty churches that belong to the typology called Chilota School of Religious Architecture on Wood. Wasn't it for the World Heritage List, I would never have heard of this place. It's left out often of Chile itineraries. 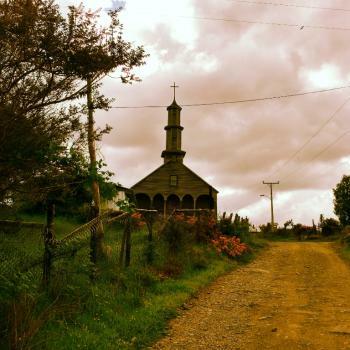 Chiloe is a green island, or actually a number of islands, with a distinct culture and history. During my Chile trip I stayed in Chiloe for a few days, both in Castro and Ancud, its main towns. I ate a lot of fish in little harbour restaurants. Salmon features prominently on the menu, for about five dollar you can have a delicious meal. My most precious memories are of the day I spent driving around the islands, looking for old or remarkable churches. I picked up a Czech hitchhiker on the way, who was much better informed about the churches than I. I think we found six that day, in hidden towns at the end of gravel roads. You can see them, and more, in the Chiloe picture gallery on this website. We visited the site in 2015. Many of the churches are quite spread out, and if you really want to see the best of what this site can offer, you’ll need to rent a car. We flew into Puerto Montt, and drove down. There’s been talk of connecting the island to the mainland by bridge for years now, but as far as I’m aware, that’s still not come to fruition, so be prepared to take a ferry. The churches, like many things Latin America, are outwardly Christian, but with a strong local flavour. There’s a decently well signposted tourist trail, though be prepared for some tricky driving conditions. Not every WHS church is on the trail and not ever church on the trail is WHS, so if your time is limited, I recommend doing a bit of research ahead of travelling. Castro makes a great central base from which to visit more remote islands. We stayed in a beautiful hostel in a palafito, a local style of stilthouse. The food was also spectacular, and unique to island. All told, we visited 11 of the 16 churches. My personal favourite was Detif on the island of Lemuy, which is the furthest south, and requires an additional ferry to get too. Lemuy is Chiloe in micro, and an immensely relaxing way to spend half a day. You can visit a majority without leaving Chiloe proper, but I think you miss out on what makes the place special if you don’t get out to one of the smaller islands. Other stand-out churches include Castro (easily the biggest of the churches), Rillan (with its stunning blue and white colour scheme), Chonchi (attractive astrological map painted on the roof of the church) and Tena (a good drive and close to the water's edge). We had no issues getting into any of the churches, with one even letting you get right up into the rafters. Make sure to visit the the stunning Chiloé National Park for an amazing unspoiled coastline, and the Islotes de Puñihuil in the north-west for a chance to see wild penguins. Chiloe is a special corner of the world, and despite the long journey and out of the way nature of the site, it was a proper highlight of all of my travels to Chile. In October 2017, I made an easy, but long, day trip by bus from Puerto Montt to Castro, probably the best base from which to visit the wooden churches. One of the best wooden churches, the Church of San Francisco, is next to Castro's bus station. I arrived in Castro around 11:30 am, so was able to visit the interior of the church, which on the day of my visit was open from early morning to noon, closed early afternoon, and then reopened in the late afternoon. Since I only had a few hours to visit several of the shingled churches, I booked a tour with Pehuén Expediciones (http://www.turismopehuen.cl), a local operator that I found while on my way for lunch at one of the restaurants in Castro's palafitos, traditional wooden stilt houses that sit above a tidal flat. There were other operators around the main square, and I expect they can set up similar day trips. 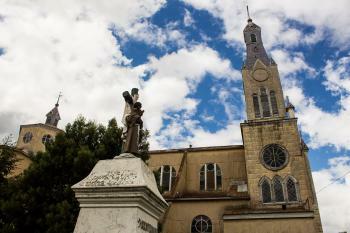 I organized a few-hour tour (45,000 Chilean Pesos, approximately US$70) to visit three nearby wooden churches. We first drove around 20 minutes to the farthest church, the Church of Chonchi (I arrived around 2:30 pm and the interior was open). While heading back to Castro, we stopped at the Church of Vilupulli (it was locked, but my guide was able to drive to a local school and return with a neighbor who maintained the key; after our visit, we returned her to the school -- without a guide, I doubt I would have obtained access to the stunning interior). Finally, just outside Castro, we stopped at the Church of Nercón (its interior was open). This is such a wonderful and peaceful part of Chile. Although the churches makes up the WHS, it's interesting to see the lifestyle here and all the small communities. Getting there is half the fun too on the ferry. With the means available to them the Chiloens built several wooden churches on their islands. These are very simple structures substituting wood for stone. If you were to strip the decoration, the tower and the columns from the buildings you would end up with large barns. Still, the simplicity and the modest means have a distinctive charm worthwhile exploring. During my visit of 2.5 days I was able to visit 7 of the 16 inscribed churches. Of these I was able to enter 3 (+1 view). I wasn’t able to find any information on the opening hours for most churches, so be ready to stand in front of closed doors. You may have more success if you join an organized tour. Castro: Currently (2016) undergoing renovations and not open to the public. Achao: Open from 10h to 15h. I was too late. Dalcahue: Wasn’t able to get in. Twice. Plenty of busses from Castro. Busses continue to both Tenaun and Achao. Tenaun: A bit remote and the road to Tenaun is terrible. They are constructing a new road, till then mind your car. You will probably be able to get in, though: The key is with a neighbor (leave a donation). Direct busses run from Castro via Dalcahue. Nice add on: You get a view of the snow covered Andes. Nercon: Nice church not far from Castro with a graveyard. The cleaning ladies let me take a peek. Villupulli: I liked this one best. A small village church on the sea. The key is with the neighbors (leave a donation), so good likelihood of getting in. Chonchi: First church I finally got in. The town itself is quite impressive. The hours and opening times are provided to the best of my knowledge. Hunting for all the churches, I spent hours in busses having the gorgeous landscape pass by. 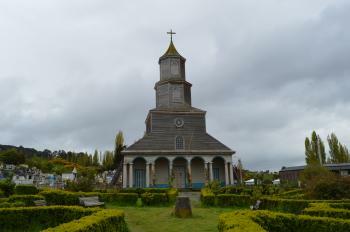 As such I feel that the Chiloe inscription should encompass more than just the island’s churches, i.e. some towns and the island’s nature, too. There are plenty of busses coming in from all over Chile. If you fly in, you will probably end up in Puerto Montt. From there it’s an additional 4h bus ride to Castro (Cruz de Sol, Quellenbus). You can also check for a direct flight from Santiago to Castro that LAN has started offering. I would stay in Castro, the center of the island and the central transport hub. It also offers the most amenities and has a site itself. Having a car helps. A lot. But plenty of churches are easily accessible via local bus from Castro. If you are short on time and want to see as many churches as possible take a look at tour operators. The easiest stretch and from what I have seen a representative selection are the four churches between Castro and Chonchi. If travelling by public transport, go to Chonchi and then hop back to Castro from church to church. Frequent busses are running this stretch of the Panamericana, so no need to plan much. The world reknown, iconic landmark you want to see are the palafitos of Castro. I did a Kayak tour to get a seaside view with Siempre Verde Tour Company (25.000$). I do think the palafitos merit inscription on the list on their own. However, the beaches the buidlings are set upon are public land and the buildings therefore basically illegal. Apparently, there aren't even public property records. Also, the buildings aren’t that old as most were destroyed by the last great tsunami in 1960 and new ones are built frequently. Still, a site to behold. The west coast and south of Chiloe are covered by impressive natural parks. From Castro hourly busses run via Chunchi to Cucao from where you can explore Chiloe National Park. The visit can also be combined with visits to the three churches along the road. From Ancud you can go and visit a penguin colony. If you come in via Puerto Montt, Puerto Varas and the Osorno volcano are nearby. From Puerto Montt you can also visit Monte Verde, one of the oldest known human settlement sites in the Americas and itself a tentative site of Chile. 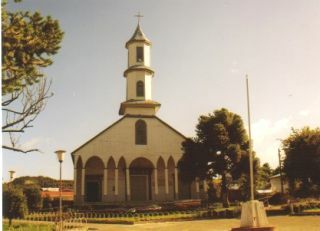 Several of the churches are aligned along the iconic Panamericana highway. Food in Castro is stellar. I ate at both Mercadito and Nueva Galicia and the quality was very good. Sole caveat: Curanto, don’t go there. Mixing mussels and pork sausage is weird at best (been there, done that, never again). I too only learned of Chiloé through the UNESCO website. On a recent trip to Chile a friend and me visited as many of the churches as we could while based in the beautiful "city" of Ancud. The churches' designs are surprisingly sophisticated and beautiful. These things were built with love and care. You should go. Important: as with most UNESCO sites: pay attention to the area surrounding it - they make the best part of the trip! Chilotas* were friendly and their food delicious (try the traditional Curanto!) and their culture rich in myths and legends; some of them downright diabolical. I found it odd, but I realized that any area that has such a huge religious presence begets a reaction. This, however, I only found in the booklets with traditional myths and stories that you'll see in every park. *Initially "locals" seemed a tad unfriendly and dry (although not rude) until we started meeting native Chilotas who complained that these people are from other regions and give Chilotas a bad name. Churches from Chiloe are so special for me. I adopted my two daughters in Achao village. During both adption procedure, I spent a lot of time to visit them, especially Achao, Quinchao and Dalcahue, Castro.. in 92 and 94. Octagons: AB Evaluation "The tower is the dominating vertical feature, both as a religious element supporting the Cross and also as a beacon for sailors. 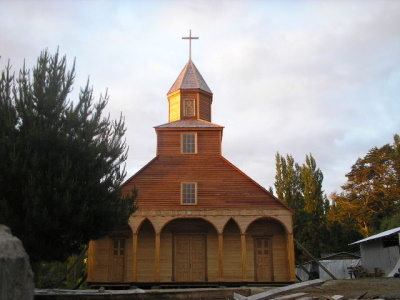 are of two or three storeys, with hexagonal or octagonal drums to reduce wind resistance"
Fusion: "fusion of European and indigenous cultural traditions"
Built in the 17th century: Earliest churches in this regional style date from the mid-seventeenth century. The 16 nominated ones are a bit younger (18th-19th century).